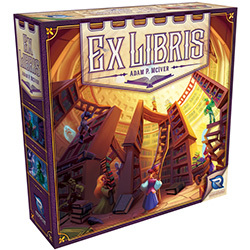 This fall, Renegade Game Studios will release Adam McIver�s Ex Libris. Set in a typical fantasy world, Ex Libris pits competing rare book collectors against each other for the title of �Grand Librarian.� To achieve this lofty post, would-be librarians must meet the strict requirements of the Mayor�s Official Inspector, as listed on the �Official Inspection Form,� including alphabetical order, shelf stability, and variety, while avoiding those books that the Village Council has banned. During the game, players send out their assistants to locate and retrieve the most rare and impressive magical tomes for their collections. Ex Libris comes with a folding game board, a double-sided dry-erase �Official Library Inspection Form,� 1 dry-erase marker, 30 tiles, 24 meeples, 1 first player token, and 158 cards. The game is intended for 2 to 4 players, ages 10 and up, and plays in about 45 minutes. Build your magic library! Preorder Ex Libris (RGS00577) today!